Last weekend I had the opportunity to celebrate a delicious birthday with my dear friend Nora. I have been gluten-free for a while (and have been feeling and looking sooo much better for it), so I was ecstatic to find out Nora had decided to create a totally gourmet gluten-free feast in honor of her own dietary transition. This recipe was a total hit, which is why I am sharing it with you. I modified it to be sugar free as well, using xylitol (a sugar alcohol derived from birch or corn). I recommend buying the kind made from birch, which is also called birch sugar sometimes. Xylitol can just about be substituted cup for cup with regular sugar, but will not spike blood sugar or cause any of the other funky sugar issues. 6. Beat egg whites until frothy by using an electric mixer; (gradually add the remaining xylitol,) beating until stiff peaks form. 7. Fold in the beaten egg whites. 8. Bake at 350 degrees until a wooden pick inserted in center comes out clean, approximately 40 minutes. 9. Use a knife to separate the cake from the non-stick paper. Please observe that the cake is quite sticky! The Flourless Chocolate Cake may be served warm or cold with Cashew Whipped Cream or Coconut Bliss (yumm!). 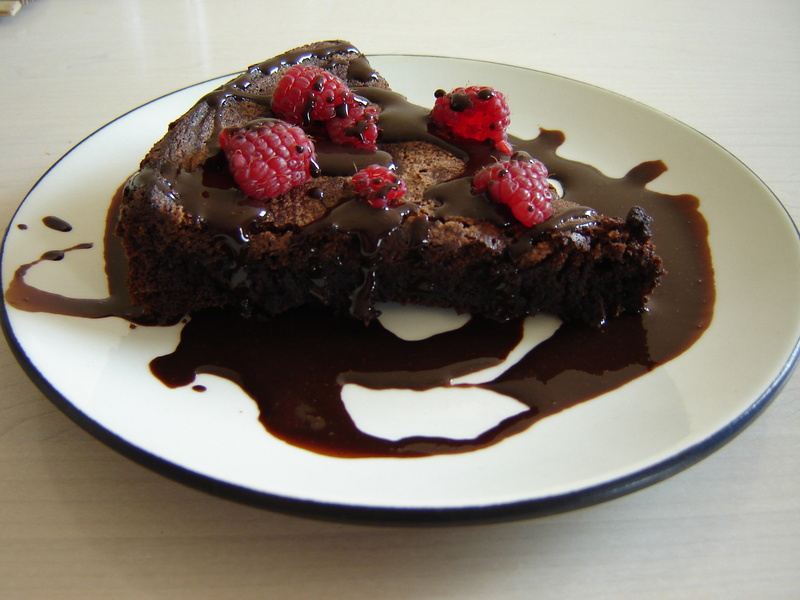 The cream may be dusted with raw cacao powder before serving, and decorated with raspberries or strawberries.